Features 8 outlets with a split-outlet design, including 4 outlets with battery backup and surge protection, so you can protect a computer, monitor and other vital system peripherals. AVR (Automatic Voltage Regulation) protects equipment against blackouts and brownouts without going to battery power. 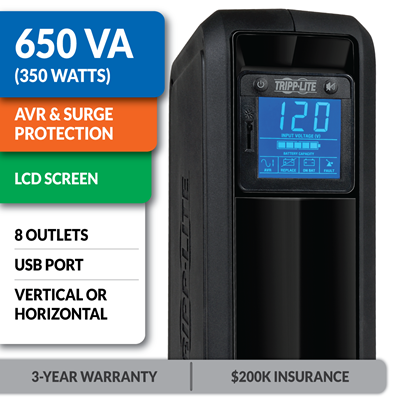 Features 8 outlets with a split-outlet design, including 4 outlets with battery backup and surge protection, so you can protect a computer, monitor and other vital system peripherals. 4 surge-only outlets are ideal for connecting accessories that don't require battery support. Shows power and status conditions in real-time on the large, rotating LCD screen. 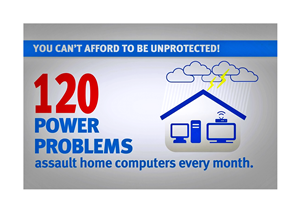 USB port works with free PowerAlert software for unattended shutdown. Adapts to tower format or rack-mount shelf format to suit your needs. Optional shelf is required for rack-mount format (sold separately). Backed by the manufacturer's $200,000 connected-equipment guarantee. AVR corrects power sags (brownouts). The illuminated LCD screen displays the input voltage, battery capacity and operating status. Vertical or horizontal placement matches your application. The 3-year warranty and $200,000 insurance reflect Tripp Lite's commitment to product quality and customer satisfaction. Single-Computer Runtime: This UPS system will support an energy-efficient desktop computer and LCD monitor for up to 40 minutes during an outage. Half-Load Runtime: This UPS system will support a 50% load (175W) for up to 12 minutes. The illuminated LCD screen shows a variety of helpful data, including input voltage, battery capacity, power status, battery status and AVR status. You can rotate the LCD to match the orientation of the UPS system for optimal viewing, and a built-in dimmer switch adjusts the brightness of the LCD backlight. $200,000 Insurance: Tripp Lite will repair or replace connected equipment damaged by surges – even lightning strikes! Free Tech Support: Chicago-based, in-house tech specialists are available by phone, e-mail and chat.